Our Work: The development created 80 en-suite bedrooms for the Salvation Army members to use when attending training courses at the centre. 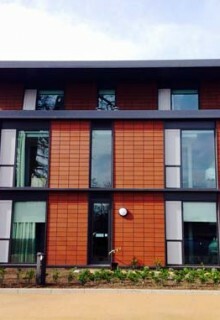 The new building replaced a 1960s-built 28 bedroom accommodation block located on the site. The building was assessed under BREEAM New Construction 2011 for Multi-Residential buildings achieving a high BREEAM ‘Very Good’ Rating. Our role entailed delivering a cost-effective strategy with maximum efficiency to achieve the required BREEAM rating. We provided guidance throughout the design and construction process to ensure that all BREEAM requirements had been incorporated.